By Jane Claire Hervey BOOM. That’s what happens when bullet meets exploding target. It’s like watching Edward Cullen and Bella Swan fall in love — that instantaneous kind of love that destroys everything and anything, but you can’t help but root for its survival and watch the pretty, little mess it makes. It’s just like that. Explosive. But there’s something missing. There’s no flame, no fire. Just vapor. That’s the beauty of exploding target devices — actually, what makes them legal. When used correctly, an exploding target device only creates a water vapor cloud and a loud bang. After mixing the oxidizer and catalyst (a container of small, white balls and a separate bag of black dust), the device only explodes when it comes into contact with a bullet from a high-powered rifle. Unbelievable? Perhaps, but the theory is tried and true. After a cop busted a driver for having Tannerite (a form of exploding target) in the back of his trunk on the premises that the driver’s car could blow up if hit, Discovery Network’s Mythbusters took the case. They put it in a car, sent a rocket at it and everything blew up except the Tannerite itself, says Tannerite creator Daniel Tanner. “It’s non-hazardous, non-flammable – it’s kind of a miracle thing, which is why I was able to get a patent on it,” he explains. Twenty years ago, Tanner say he created the device to help facilitate target shooting in the hilly areas of Oregon. Native to the state, he explains shooting targets in mountainous regions can be time-consuming and difficult: “When you’re climbing two or three mountain ranges to see if you hit your target, it’s kind of ridiculous.” To fix this problem, he created Tannerite. Since the device explodes into a puff of vapor on contact with a bullet, a shooter can easily tell if the target has been shot, even from hundreds of yards away. Although initially created for personal use, the device quickly gained a reputation with sniper teams, hunters and gunmen. Without even meaning to, Tanner stumbled into his own business. But the business of exploding targets isn’t always easy. As Tanner’s product gained popularity, competitors caught on, creating other exploding targets like Shockwave. Competition, in turn, has caused the target size to become bigger and bigger. For example, buyers can purchase four-pound Shockwave targets for as little as $25 dollars, compared to Tannerite’s half-pound and one-pound options (which are sold in packages of ten, ranging from $70 dollars to $130 dollars). Although clients can only purchase exploding targets in these small quantities, they may legally purchase as many packages as they want. Since exploding rifle targets fall under federal black powder laws, which makes it legal to explode up to 50 pounds of black powder, it’s also legal to explode up to 50 pounds of exploding rifle target at one time. Bigger targets mean one thing — a bigger boom — and consumers caught on. One can see this just by typing “exploding rifle targets” into YouTube’s search bar. Hundreds of videos pop up, which depict people blowing up everything from their old, beat-up Chevys to Playstation 3s. The record-holder of these videos goes to Andrew of GY6vids. In his video, he detonates a raft with 250 pounds of Inthered exploding targets. To legalize the explosion, Andrew had a licensed blaster on site and blew up the raft in a pond on private property. “I have always tried to break records, so when I got the chance to do so, I had to beat it,” Andrew says. Although Andrew followed the rules when making his video, this isn’t always the case. In some of the videos, shooters explode computers and heavy metal machinery, which launch torpedo-like shrapnel into the air as onlookers partake in fits of giggles and astonishment. In others, they combine the exploding target with magnesium or gasoline to create a flame. This is where the use of exploding targets gets dangerous and illegal. Exploding targets can only legally be used for sporting purposes, which cover things like target shooting. This means using an exploding target for recreational use, i.e. blowing up anything other than the target, is illegal. Also, the devices weren’t made to blow things up with the aid of other chemicals. “People being people always want to take something to the extreme. There’s a ton of stuff on YouTube of people doing that kind of junk and that’s where the real danger lies,” Tanner adds. During the summer of 2012, Jennifer Plank of Indiana lost the use of her hand after a friend exploded an old clothes dryer using Tannerite, reports Richard Essex from Indiana’s WTHR. A chunk of metal hit her fingers while attempting to video the explosion with her camera phone. This incident pushed Indiana State Senator Jim Merritt to introduce Senate Bill 0262, which outlines three new regulations for Tannerite: the product could only be sold in stores by a retailer (most Tannerite purchases are made online); it could not be sold to persons under 18 years of age; it could only be purchased with a valid government-issued ID. Although introduced in Indiana’s 2013 first regular session, the bill has already been dropped for unknown reasons. Merritt was unavailable for comment. Despite the dangers associated with misuse, exploding target sales are healthier than ever, Tanner says. The exploding target trend seems to be picking up in Austin, too. Austin’s McBridge Guns Inc. received their first shipment of four-pound Shockwave binary explosives last month, because “customers have been asking for them,” said shop owner Joseph McBridge. The store has never carried exploding target devices on its shelves before. 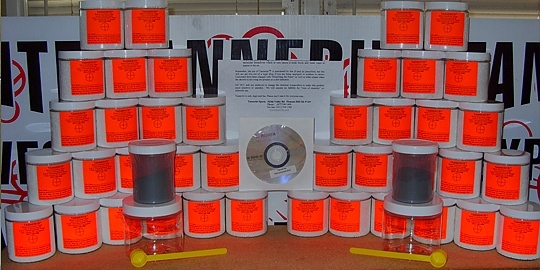 As the popularity of exploding target devices grows, whether linked to the recent surge in explosion-related YouTube videos or not, GY6vid’s Andrew warns users to practice caution when using Tannerite and other exploding target devices, including clearing the area of debris and flammable material, wearing eye and ear protection, using the targets in a legal spot, staying at the recommended safe distance and following the targets’ package instructions. “Just like many other things we buy on a regular basis — gasoline, matches, Tylenol, alcohol — they [the exploding targets] can be dangerous if not used in a safe, responsible way,” he says.